At School of the Fighting Arts we teach all ranges of combat. 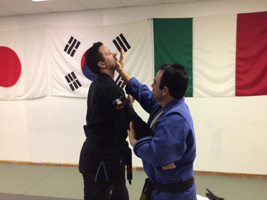 American Combat Ju-Jitsu includes long-range combat where students learn strikes, kicks and blocks. Students will also learn locked-up or clinch which includes strikes using their knees and elbows, takedowns and Judo throws. Another main component focuses on ground combat which includes Japanese and Brazilian Ju-Jitsu with strikes. We also teach Street Self-Defense where students learn to attack the weak parts of the body using strikes, kicks, or joint locks. Adult students will learn gun and knife self-defense. In these classes adult students learn how to disarm an attacker who has a gun or knife, which in today's society is the most likely way an adult will be attacked.